It is normal for Olympic competitions to have a medal table: a list of the countries in the order of golds, silvers, then bronzes. Does such a table by country exist for medals which were won and then revoked for violation of rules in the Olympic Games? 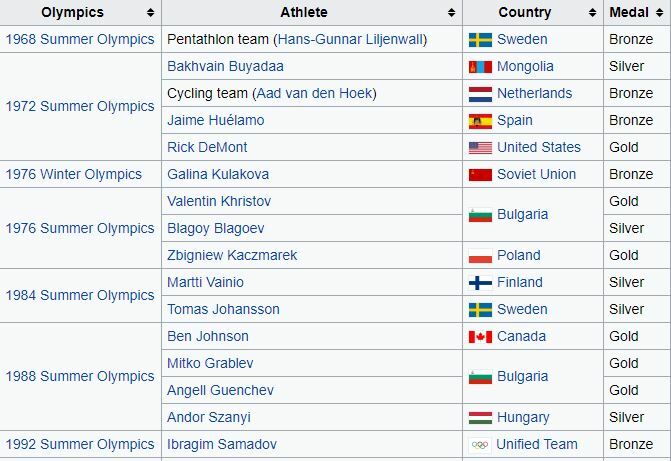 It's not been answered for some time but now there is a complete List of stripped Olympic medals in this Wikipedia link. Not the answer you're looking for? Browse other questions tagged history olympics awards or ask your own question. Gold, silver, and bronze medal sweep in Winter Olympics by a single country? Does any competition currently give solid gold medals to winners?